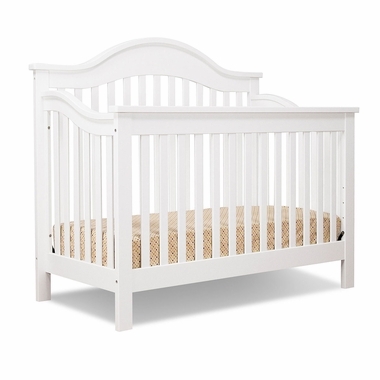 The clean white finish of Da Vinci's Jayden 4-in-1 Convertible Crib is sure to brighten any nursery. The pleasing arcs on the back and sides combine with the dignified molding to create a low front crib elevation making it easy to get your baby in and out of the crib. The mattress lowers to four heights to accommodate your growing child, and the solid New Zealand pine frame easily converts to a toddler bed with the included conversion kit. Use the headboard and footboard with a separately purchased rail kit to create a full-size bed that preserves the design elements you've so carefully chosen.